A new generation of Irish boys appeared on Earth in 2012 and plan to rule "The Sheehan World" in 2013. 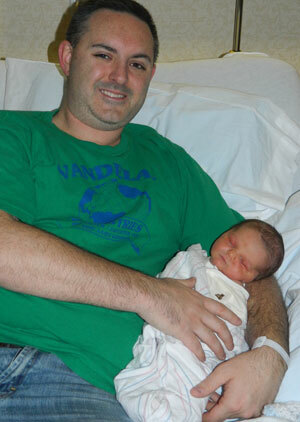 First on the scene was Zachary Peter Sheehan, second son of Alicia and Shawn Sheehan, who was born on March 25. Zack weighed in at a whopping 9 pounds, 3 ounces, and looks a lot like his brother Nolan, who was born in August 2010. Zack and Nolan are so close in age, they qualify for being called Irish twins. (There's a history of Irish twins in The Sheehan World, with Great Aunties Kathy and Trisha being only 14 months apart, and Uncles Brendan and Ryan Sheehan only a couple of years apart.) We can hardly tell which is Zack and which is Nolan in the family photo above! About 10 weeks after Zack was born, Wendy Walsh, with a little help from Patrick Hickey, gave birth to Patrick Hickey Jr., on June 4. 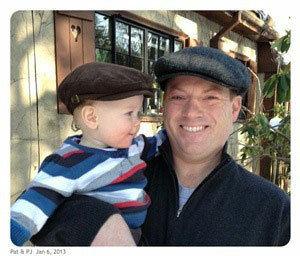 Known as PJ, he is the first child of Patrick Sr., (at left) and the fourth for Wendy. Great Aunty Kathy got to meet both PJ and Zack on a trip to Massachusetts in July 2012. PJ was so excited to meet the publisher of The Sheehan World, that he peed all over her! Finally, along comes Braeden Mahoney, little brother of Molly Mahoney, and son of Michael and Dee Mahoney. Braeden was born on Nov. 26, 2012, just a little too late for Red Sox season. But he immediately became an avid New England Patriots and Boston Bruins fan as well as a Celtics fan, of course. He has yet to meet his Great Aunty Kathy but he has met Granny Moe aka Trisha and likes her a lot. Braeden's arrival makes the number of Sheehan World great-nephews almost too many to count. Nonetheless, with all the new lads on the scene, The Sheehan World declared 2012 the Year of the Great Nephews.